Extracting File Checksum Integrity Verifier (FCIV). File Checksum Integrity Verifier (FCIV) is a command-line checksum calculator tool provided for free by Microsoft. Once downloaded and placed in the correct folder, FCIV can be used like any other command from the Command Prompt. FCIV works in Windows 10, 8, 7, Vista, XP, 2000, and most Windows server operating systems as well. File Checksum Integrity Verifier is used to produce a checksum, either MD5 or SHA-1, the two most commonly used cryptographic hash functions for checking a file's integrity. See Step 11 below for more information about using FCIV to check file integrity. Time Required: It'll only take a few minutes to download and install Microsoft File Checksum Integrity Verifier. 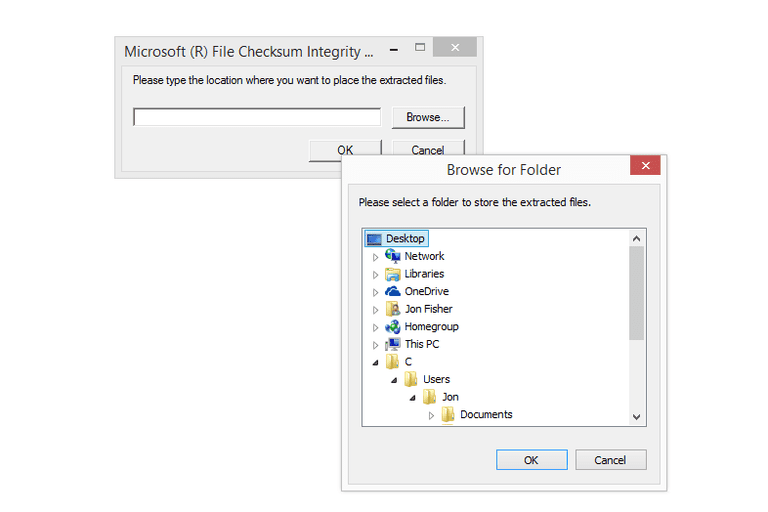 Download Microsoft File Checksum Integrity Verifier. FCIV is very small - around 100KB - so downloading it shouldn't take long. Once you've downloaded the File Checksum Integrity Verifier installation file, run it by double-clicking on it (or double-tapping). The file name is Windows-KB841290-x86-ENU.exe in case you're looking for it in whatever folder you downloaded it to. A window with Microsoft (R) File Checksum Integrity Verifier will appear, asking you to accept the terms of the License Agreement. Click or tap Yes to continue. In the next dialog box, you're asked to choose a location where you want to place the extracted files. In other words, you're being asked where you'd like to extract the FCIV tool to. In the Browse for Folder box that appears next, select Desktop, listed at the very top of the list, and then click/tap OK. Select OK back on the window that has Browse, which you should have been returned to after clicking OK in the previous step. After the extraction of the File Checksum Integrity Verifier tool is complete, which takes around one second in most cases, click or tap OK on the Extraction Complete box. Now that FCIV has been extracted and is on your Desktop, you need to move it to the correct folder in Windows so it can be used like other commands. Locate the just extracted fciv.exe file on your Desktop, right-click on it (or tap-and-hold), and choose Copy. Next, open File/Windows Explorer or Computer (My Computer in Windows XP) and navigate to the C: drive. Locate (but don't open) the Windows folder. Right-click or tap-and-hold on the Windows folder and choose Paste. This will copy fciv.exe from your Desktop to the C:\Windows folder. Depending on your version of Windows, you may be prompted with a permissions warning of some kind. Don't worry about this - it's just Windows being protective of an important folder on your computer, which is good. Grant the permission or do whatever you need to do to finish the paste. Now that File Checksum Integrity Verifier is located in the C:\Windows directory, you can execute the command from any location on your computer, making it much easier to create checksums for file verification purposes. See How to Verify File Integrity in Windows with FCIV for a complete tutorial on this process. You can choose to copy FCIV to any folder that's part of the Path environment variable in Windows but C:\Windows always is and is a perfectly good location to store this tool.